Eduardo Alvarez is a graduate of the University of Florida in Wildlife Ecology and Conservation. He has lead or directed several water, harpy eagle and gopher tortoise conservation projects in the Western hemisphere. He teaches at City College and has taught in the Alachua County Schools. 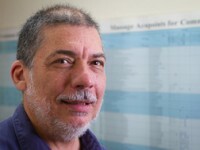 Dr. Alvarez currently teaches courses in Western bio-medicine (Environmental Science only).